utility for GeForce graphics cards. 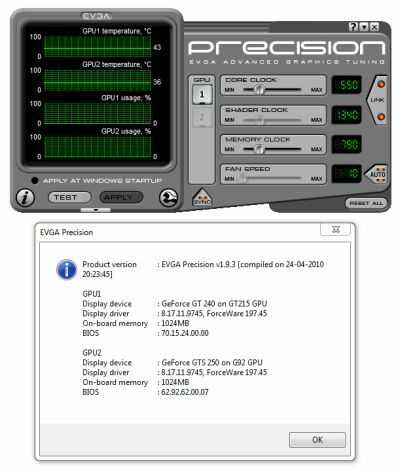 EVGA Precision allows a fine tuning of the graphics card GPU core / shader and memory clocks. To download EVGA Precision, you have to be a member of EVGA forums. The thread about version 1.9.3 in EVGA forums is HERE. This new version of Precision comes with a new OSD server in version 3.70. The OSD server (OSD = On Screen Display) allows to display various information (clocks, temperatures…) directly in the 3D applications.